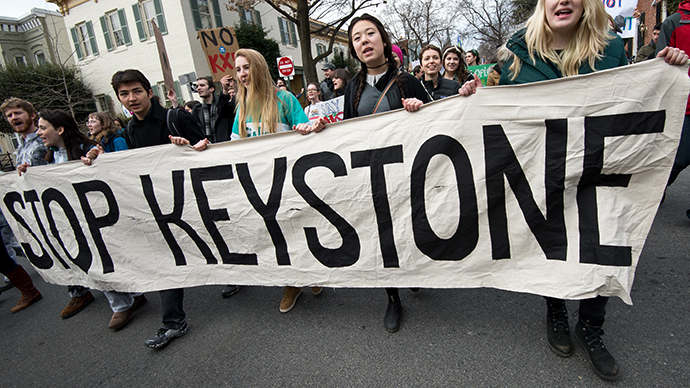 A mass crowd of protesters joined Saturday the anti-pipeline rally in Washington to say ‘No” the proposed Keystone pipeline - a $5.4 billion project that would pump tar sand oil from Alberta, Canada through the US to Texas refineries. 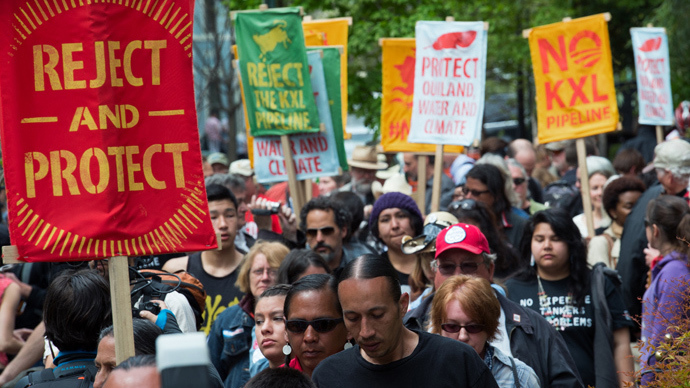 Chanting slogans and carrying placards, demonstrators called on the president to “protect our sacred land” and “sacred water.” Participants of the event say on twitter that “thousands of #NoKXL supporters” took to streets for the demonstration. 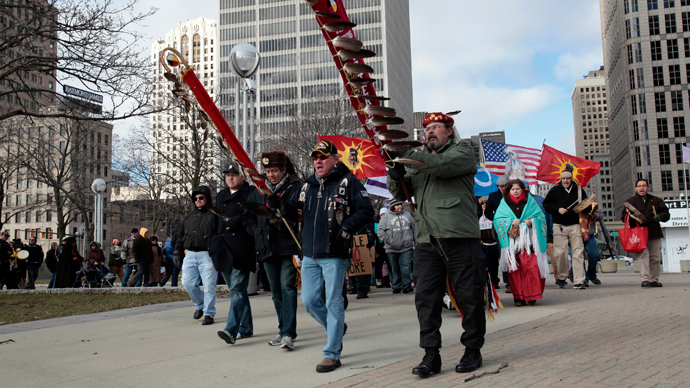 The event kicked off on Tuesday with the Cowboy and Indian Alliance, a group of ranchers, farmers, and tribal communities from along the Keystone pipeline route, riding on horseback through the American capital. Dressed in traditional clothes – cowboy hats and native headdresses – demonstrators marched through downtown DC and set up a camp with traditional tepees on the National Mall near the White House. The encampment has been the center of the week-long protest which included a whole bunch of events such as ‘water ceremonies,” “music and sharing stories,” documentary shows, flash-mob round dance and other ceremonies. Saturday though was planned as the most important day of the week, with several thousands of people expected to join the protest. “In the American imagination, cowboys and Indians are still at odds. However, in reality, opposition to the Keystone XL tar sands pipeline has brought communities together like few causes in our history.Tribes, farmers and ranchers are all people of the land, who consider it their duty as stewards to conserve the land and protect the water for future generations,” a statement on the official website for the Reject and Protect movement said. Once bitter rivals - cowboys and Indians, aboriginal and non-aboriginal people, from across the US and Canada - have come together to fight against the pipeline.Activists fear that if the project, which is yet to be given a go-ahead, may cause severe damage to the environment, pollute water sources and pose a threat to public health. The project has been mulled over for quite a while now: Canada's oil industry applied to build the pipeline several years ago but it still needs to get the green light from Washington. The planned pipeline has seen strong opposition in the US, with many believing the carbon-intensive impact that results from the extraction of tar sands will worsen the effects of climate change. 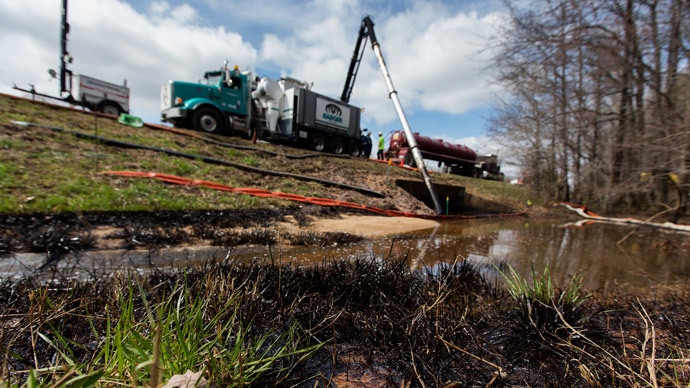 They also fear the pipeline will put nearby communities at risk of oil spills and their subsequent fallout. Last week, the White House postponed the decision on the Keystone oil pipeline, saying that it would give more time for federal agencies to weigh in on the project, and setting no new deadline for comments. The Calgary-based company that wants to build the pipeline, TransCanada Corporation, said it was “extremely disappointed and frustrated with yet another delay”. “Keystone XL improves American energy security, minimizes the environmental and safety impacts of moving that oil to U.S. refineries, helps contribute to jobs and American businesses and continues to have the support of a strong majority of Americans and Congress. It is truly in the national interest of America and a majority of Americans in poll after poll after poll continue to agree and just want this pipeline built,” Russ Girling, TransCanada’s CEO and president said in a statement.